Our board-certified periodontist and implantologist, Dr. Daniel Lauer, utilizes some of the latest technology to provide you with safe treatment, precise and virtually painless procedures, and successful results. From laser gum care to digital mapping for dental implants, our advanced technologies combine with the experience of a periodontal specialist for procedures that can meet your needs with effective treatment and without excessive downtime. For more information on the advanced technologies we employ here at Precision Periodontics & Implant Dentistry, please contact us today. Waterlase MD™ is a signature technology here at our practice, offering patients virtually pain-free gum treatment with exceptional results. This advanced laser technology is designed to treat a number of cosmetic and functional periodontal issues without the need for invasive surgery or cutting of the soft tissues. Waterlase MD™ allows you to undergo a number of procedures, including gum disease treatment, laser orthodontics, gum treatment, and cosmetic gum lifting, with little to no discomfort and virtually no recovery time. 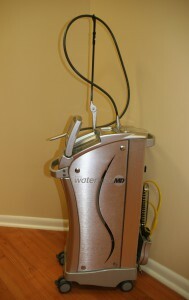 Waterlase MD™ is a combination of high-energy laser technology, air, and water. Beams of light are applied directly to the treatment area with a guided handpiece, precisely targeting the affected areas of the gums without harming surrounding tissues. With Waterlase MD™, there is less bleeding, less risk of infection, and much less recovery time required after treatment. In fact, many patients do not experience any downtime at all after treatment with Waterlase MD™. Waterlase MD™ can be used in patients of all ages. It is a quicker and safer way to perform gum treatment, and best of all – it is virtually painless. Creating a high-definition image of your teeth, gums, and oral structures is one of the first steps in the dental implants process – and it’s also the most important one. When it comes to missing teeth replacement with dental implants, Dr. Lauer is committed to giving patients the most accurate and precise results. This is why he offers digital oral mapping with the state-of-the-art imaging technology. This advanced imaging system allows Dr. Lauer to get a look at virtually every angle of your jaw, teeth, and gums. Utilizing cutting edge digital mapping, Dr. Lauer can be more assured of a practically perfect fit for your dental implant, increasing the chances that your implant will look, feel, and function just like a natural tooth. With state of the art imaging capabilities, Dr. Lauer can create a truly customized dental implant plan for the best possible results. With the use of Planmeca’s ProMax® 3D, Dr. Daniel Lauer is able to provide the most precise results possible for a range of periodontal and implant dentistry procedures. This advanced x-ray device uses cone beam technology to take digital images of a patient’s jaw and teeth, which makes it a great diagnostic tool and powerful aid in planning treatment. The high quality images are taken in three dimensions to give a complete view of the mouth. This allows Dr. Lauer to identify vital jaw structures and to discover previously concealed dental problems that need to be addressed. While the ProMax® 3D is especially useful to help map the mouth for dental implants, it offers detailed information that can help Dr. Lauer in every treatment. 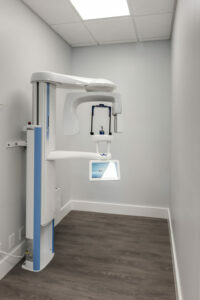 Digital x-ray technology, also known as Computerized Digital Radiography, is a safer and more precise way to take pictures of your teeth and gums. 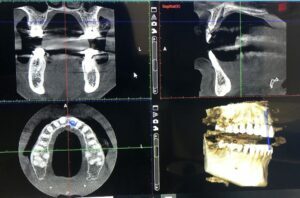 With digital x-rays, Dr. Lauer can have images of your mouth captured and delivered on a computer monitor almost instantaneously. Digital x-rays reduce your exposure to radiation by almost 90 percent when compared to traditional film x-rays. They eliminate the need to develop x-rays using chemicals that are harmful to the environment, and they can speed up claims processing with your insurance provider because they can be sent electronically. Plus, digital x-rays offer superior picture quality so that Dr. Lauer and his team can precisely identify any problems going on with your teeth and gums. 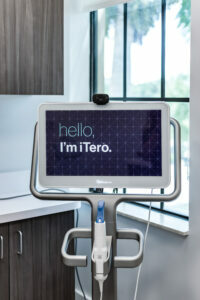 The iTero® Element 2 is an intraoral scanner device that allows Dr. Lauer to create surgical guides for placing dental implants with the utmost accuracy and predictability. The advanced system offers faster processing speeds, completing a full arch scan in as little as a few minutes, and produces clearer digital images with its improved screen resolution. In addition to providing more precise implant guidance, Dr. Lauer is able to utilize the technology’s enhanced features to help his patients better visualize their treatment by showing the detailed images that are available on the wide touch screen monitor. To learn more about the many advanced options we offer here at our practice, or to schedule a consultation with Dr. Daniel Lauer, please contact Precision Periodontics & Implant Dentistry.